An older article Jay and I did together in 2012; I thought it deserved another moment in the spotlight. Jay and I talk daily sometimes, and I truly cherish his friendship and VW knowledge. I’m sure y’all do as well. If you have a moment, please chime in below and let Jay know how much he means to us all here at 1967beetle.com. 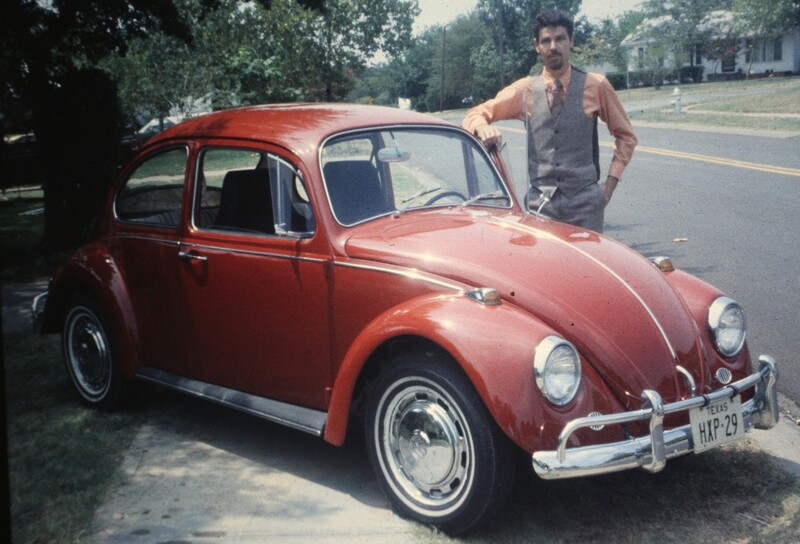 This L456 ruby red ’67 Volkswagen Beetle began its life in Wolfsburg, then made its way across the Atlantic probably to the Texas Coast where it disembarked and was trucked to Lubbock, Texas, (Montgomery Motors at the time), the lone VW dealership in the lower South Plains area. Time has erased some evidence, but probably its first owner was someone that used the little car as a delivery vehicle. When it came up for sale about 1970, my family was home in Lubbock from South America on vacation. We needed a car and located this one from a newspaper advertisement. Dad, who had past experience with his ‘65 Bug and I went to check it out. We took it for a drive. The day was particularly windy and as we turned southward off the Loop, the hood popped open and we were blinded. Dad managed to pull to the side of the frontage road and we closed the hood. I recall the car cost us six or seven hundred dollars. Our son was nearing 18 months old at the time. We found that we could make the back seat into a nice bed and play area for him. The floor between back and front seats could be filled with baby supplies that made the area between the seats level. In this car, we traveled about the Panhandle of Texas visiting friends and relatives. Then, we headed for Washington State, then down through Oregon and California, visiting along the way. Finally, we cut through the desert, across Arizona and into New Mexico. When we returned to South America in a few months, the car passed to my sister who eventually took residence in Dallas. She made numerous trips between Dallas and Lubbock. In 1976, we returned to Dallas to live. My sister still had the car but was terminally ill. She lent the car to us to drive. Following her death in ‘77, we purchased the car from her husband. The Red Baron saw our children grow into teenagers. He faithfully took children to school. He took my wife shopping. He took me to work until ’83 when I bought a pickup to aid me in my contracting business. He eventually helped the children to learn to drive. He even became our daughter’s vehicle for getting to and from work. The Baron’s engine finally “dropped a valve” at just over 129K miles. I rebuilt my first VW engine on the living room coffee table and The Baron had new life! When our daughter needed a car with air-conditioning, The Baron began to sit for longer and longer spells in the driveway. Finally, following some renovation in the ’90s, he went to a new owner, a long-time VW friend who worked for the Postal System in Plano, TX. A few years later, he returned to our place for a complete brake system overhaul, tune-up and general cleaning. Shortly, he also received his third paint job. It wasn’t much after that that I received a call from a lady. She explained that she had purchased the car but was having some problems with it. I helped as much as I could but soon found that although she had purchased the car for her daughter, her daughter had nothing but disdain for it and purposely did things to side-line the Bug. The Baron looked more and more worn. Not much later, I was informed that the car had been sold to yet another person, in Sachse, TX. I made a swing by the place to see my old and faithful friend and found him with dented decklid, faded paint and very run-down. There were those familiar marks from the care which he had received during the years at our house but they were fast waning. That was the last we heard of The Red Baron. Perhaps he lives on. We may never know. But we can certainly say of him, “He was the best of the best!” We’ll never have another one as fine and dignified as he. Thanks, Jay for sharing your story with 1967beetle.com. I agree! I love Jay’s outfit. I’m guessing that “The Baron” lives. Let’s all be on the lookout for this great car. Thanks guys. Jay has a real passion for these old cars and it shows. I hope to see more articles from him in the future. Ok, so I’ll be first to start this off again. Thank you, Jay for all you do! The final sentence applies to Jay as well as his fine and dignified Red Baron. Thanks Jay, Eric, and all your contributors! What’s the story on the high back front seats? You lost a little bit of me there but still a great story. …great story from a great guy! great story funny how life evolves made my day! This is too funny! Jay you the man! Wonderful Story Jay! Thank you for sharing ! Very much enjoyed your story. You an I are about the same age so parts of your story sound like mine, only I let a sister use mine fo about eight while I was overseas , and she kindly gave it back to me. I really liked the engine rebuild part. I did the same thing using John Muirs Idiot book, and it was very successful. Lasted longer than the original engine. Try that with any car made today. We lived in the best times back then. You are so correct. The VW Beetle is the best car ever designed. I love more than anything that I can do all of my own work myself. Great Story, Jay! This tale reminds me of my late father’s own beloved ’67 Beetle, aka Fritz. I will pen a story with photos some time soon. One thing that bonds many of us long time VW Bug enthusiasts, or Bus, or 356Porsche was the keen interest to work on a car that was, unique, fun to drive, dependable, affordable, but most of all, we could fix ourselves. Still holds true today.